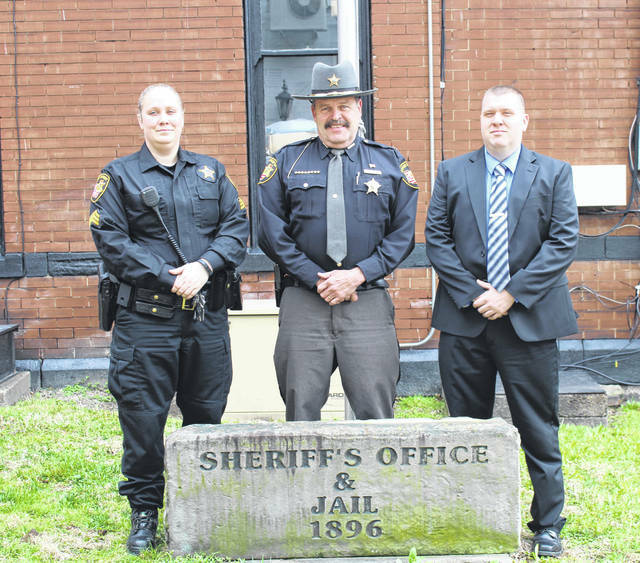 POMEROY — Two law enforcement officers were recently promoted within the Meigs County Sheriff’s Office. Sgt. Frank Stewart was recently promoted to the newly created investigator position at the sheriff’s office, while deputy and K-9 handler Brandy King was promoted to Sergeant. Stewart will retain his rank as sergeant while in his new role. “An investigator is something we have needed for a long time,” said Sheriff Keith Wood of the new position. He said in the short time since Stewart took on the role it has already proven successful. Wood said that Stewart is “very motivated” and has good connections which will assist in the new position. Stewart now has an office in the sheriff’s office and Wood encouraged members of the community with information to share to come speak with Stewart. Having the investigator frees up deputies for other duties while allowing for someone to be focused on investigations full-time. It has been a positive change for the department, said Wood, with everyone adjusting to the change. “It is nice to have someone who can focus on investigations 40 hours a week whether it would have been myself or someone else,” said Stewart. He noted that in the normal role of a deputy with the sheriff’s office there is not time to devote to investigations without having to go on transports or other calls which may take the deputy away from the investigation for a long period of time. Wood said that Stewart has already been working with the Gallia-Meigs Major Crimes Task Force on some cases, as well as working on a cold case with BCI. He will also be looking into some other office’s older cases which remain unsolved, some for decades. As for the promotion of King, Wood said that with the transfer of Stewart to investigator it opened up a sergeant position. The opening was posted to those in the office, with King coming in at the top in testing, background and the interview process, said Wood. Wood stated that he is not sure if King was the first female deputy or road officer for the county, but that she has excelled to the point that she has now earned the promotion to sergeant. Sheriff Wood praised the work of both Stewart and King is earning their promotions. “I am proud of both of them… they care about the community and care about making the community safer,” said Wood, adding that both have a strong work ethic and have the ability to motivate those around them to work harder. Investigator Sgt. Stewart joined the sheriff’s office in September 2017 and was promoted to sergeant in the Spring of 2018. Stewart has nine years of law enforcement experience having also worked with the Middleport Police Department and the Gallia-Meigs Major Crimes Task Force. Sgt. King was previously a sergeant with the Pomeroy Police Department before joining the Meigs County Sheriff’s Office in 2013. Later in 2013, King became the office’s K-9 handler, joined by partner K-9 Bax. King and Bax continue to work together nearly six years later. Bax, who will turn nine this year, is expected to retire from his role with the sheriff’s office later this year said Sheriff Wood. An exact time frame for the retirement has not yet been determined. A second canine joined the sheriff’s office last year with K-9 Cheri working with Deputy Tylun Campbell. With more than 14 years in law enforcement, King said she is excited about the promotion and the opportunity to further her career.